- 5021 (Combination Entry w-Key Override). - Delivery: The Simplex 5021R-26D Pushbutton Lock is In Stock and Available to Ship. - Special Orders: For pricing on any Simplex 5000 Lock not on this page please contact Taylor via e-mail (sales@taylorsecurity.com) or call 1-800-676-7670. The most full featured of Kaba's mechanical pushbutton lock solutions, the Simplex 5000 Series offers unparalleled strength, convenience, and flexibilty. This BHMA Grade 1, heavy-duty lock contains internal drive parts of cast stainless steel and clutch-free direct-driver design. The Enter Button is easy to press, and its design and finish options fit virtually any existing dècor. Designed for the simplest installation possible, the non-handed design fits both left-and right-hand doors and if needed, allows for handing changes in seconds. 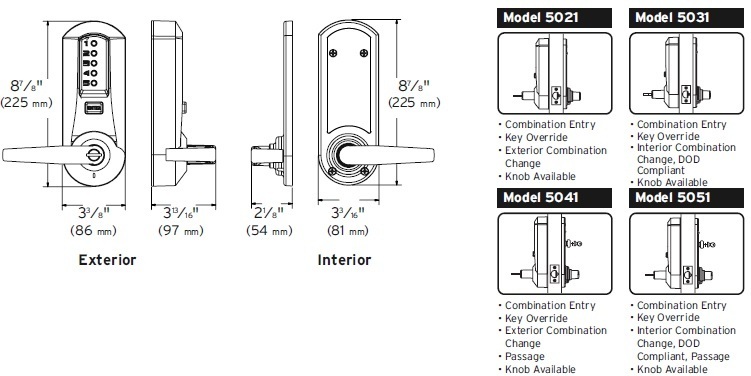 Models are available for cylindrical, exit trim, and mortise locking options and include a choice of key override options. Simplex 5000 locks are ADA compliant and include a three-year warranty. The Simplex 5000 locks are ideal for locations with a high personnel turnover rate such as date processing centers, employee entrances, R&D labs, apartments, dormitories and restricted areas in hospitals, airports and other institutions. Number Keypad: Vandal resistant, 5-button, plus "Enter" button. Strike: Standard strike plate, ASA strike plate. Key Override (Optional): Key Override models (5021) accept removable core cylinders. - 5021 - Extra Heavy-Duty Combination Door Lock with Key Override. Keyway: Sargent (5021R). Special Order Information: For pricing on any function, keyway or finish of the Simplex 5000 Series not found on this page please contact Taylor Security direct via e-mail (sales@taylorsecurity.com) or call us toll-free at 1-800-676-7670. Schlage: 5021S, 5031S, 5041S. Medeco/Yale: 5021M, 5031M, 5041M. Best: 5021B, 5031B, 5041B. Corbin Russwin: 5021C, 5031C, 5041C. Door Preparation: Easily installs on wood or metal doors. ASA 161 door preparation with additional through holes. Items Supplied Include: Lock assembly, installation manual, full-scale template, and required installation hardware.